When Yadira Thabatah converted to Islam 13 years ago from Catholicism, she was eager to learn everything she could about her new religion. The only thing slowing Yadira down was that the 34-year-old mother of four living in Fort Worth, Tex., was born blind. 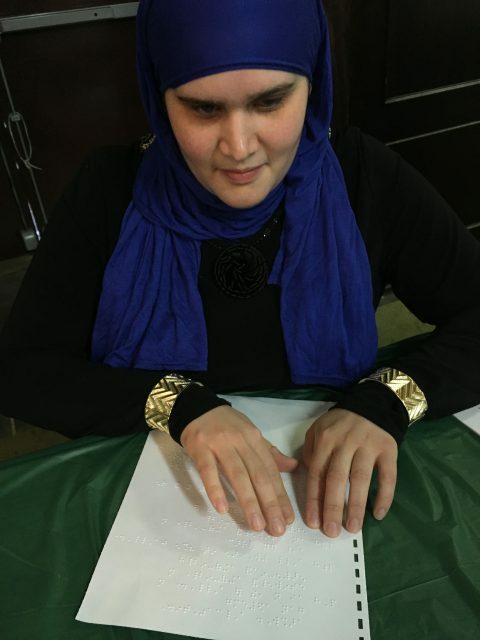 When she and her husband, 33-year-old Nadir Thabatah, who is legally blind but has partial vision, looked for high-quality, English-language resources that she could read, they found nothing. This morning, the Disability Rights Advocates (DRA) filed a federal lawsuit against Lyft at The United States District Court for the Northern District of California. According to the complaint, the San Francisco-based ride-hailing app excludes persons with mobility disabilities who need wheelchair-accessible vehicles (WAVs) in the San Francisco Bay Area. The faces you see in your everyday life ultimately define what you see as normal, says Jordan Nicholson, a Getty Images photographer. People with disabilities like myself make up 20% of the population. But many people with disabilities say that for decades, they’ve felt invisible as if they were hidden in plain sight. Only infrequently do our images show up on television and film, in advertisements or in catalogs—and when we do, are often tinged with a sappy sort of inspirational-ism that some people in the disability community refer to as disability inspo. (Translation: It makes others feel good while completely ignoring the fact that we want to be treated like people first.) Applauding us when we do what other abled bodies do every day gives the impression that we are largely incapable, while the opposite is quite true. The hashtag #AbledsAreWeird started with a childhood memory that occurred to writer and disability rights activist Imani Barbarin: She was in her community swimming pool when a man threw her crutch into the pool to “help her swim.” Naturally, the crutch sank, and she had to fetch it from under water. “Billionaire Jim Mellon bets that a ‘stock market mania’ will be sparked by technologies that make people live past 100.” The investor and astute stock market trend catcher shared this prediction in an interview for NEO.LIFE. It appears that anti-aging technology could be the investors’ dream and has the possibility to make a big wave in the biotechnology industry. Such technology could offer a valuable window of opportunity, one that every business executive, investor and stakeholder in the health sector may want to look into. Legalized medical pot may be a boon to older Americans, boosting their health and ability to work, a new study finds. “Research [on medical marijuana] has largely ignored older adults even though they experience the highest rates of medical issues that could be treated with medical marijuana,” said co-author Lauren Hersch Nicholas. She’s an assistant professor at the Johns Hopkins Bloomberg School of Public Health in Baltimore.